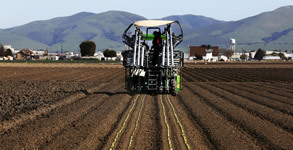 Geoffrey Mohan for LA Times: Driscoll’s is so secretive about its robotic strawberry picker it won’t let photographers within telephoto range of it. But if you do get a peek, you won’t see anything humanoid or space-aged. AgroBot is still more John Deere than C-3PO — a boxy contraption moving in fits and starts, with its computer-driven sensors, graspers and cutters missing 1 in 3 berries.